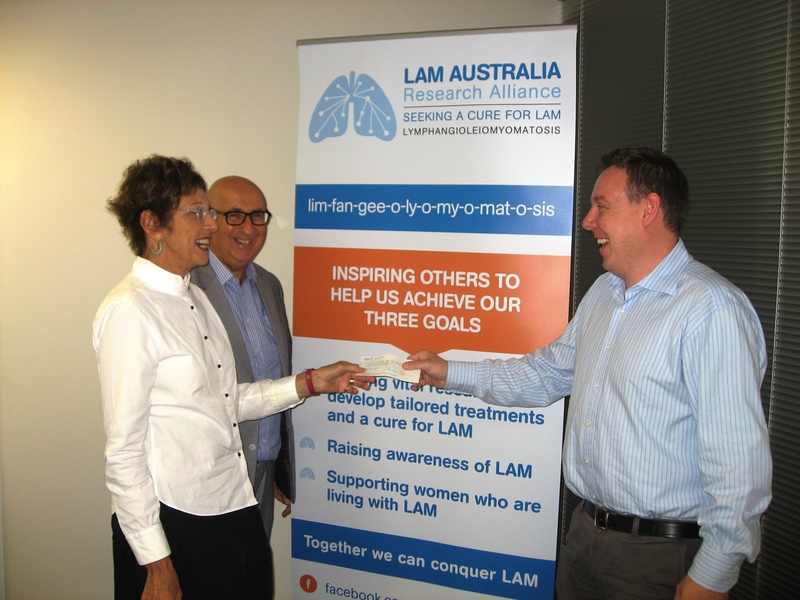 On 05 February 2015, LAM Australia President, Janet Neustein presented a cheque for $50,000 for ongoing LAM research to Brian Oliver, Head of the Molecular Pathogenesis Group, Respiratory Cellular and Molecular Biology at the Woolcock Institute of Medical Research. This includes $33,000 donated by the Roth Charitable Foundation. Watching the presentation is LAM Australia Treasurer, Michael Neustein. Dr Oliver comments: “The fight against LAM is difficult, but the important thing is that LAM has a community of committed researchers who are doing their best to discover new ways to diagnose, manage and help people with LAM. I can’t say that the next big breakthrough is just around the corner. It may well be, but ethically and morally it would be wrong for me to say this. A big breakthrough might occur, but generally research is like LEGO, each lab puts one or two bricks in the wall and together the eureka moment happens”.